...and list 7 things about yourself. hmmm...then...I do not smile.... no problems with 1 & 2...[ the award is in the side bar] #3...I shy from,because I want to nominate you all. you all are inspiring...and you all deserve awards... and 7 things about me... well..that is the hardest of all. I've said a little here and here and here ... but... you know, I really shy from that... so what I will say is: In true Virgo fashion,I am my own worst critic; I am soft where I should be hard; and hard where I should be soft; I try very hard not to be artificial; I try to be true and loyal; I do smile-although in front of the camera I freeze; and I love to laugh-even if I come across as serious. see...a frozen sort of smile... but one none the less. and some knitting... well that always makes me smile. And I want to make someone else smile. So in honor of me receiving and award...I am having another little drawing. a surprise,because after all it is Halloween week, so some mystery should be involved. You will like it... you will smile... I'll reveal it in a week or so. leave me a comment and I'll count you in... until then... all I will say is Namaste... smile. congratulations on your award, and so nice to learn a little more about beautiful you. congrats on the award and i agree, i hate being in front of the camera. i feel very awkward. you, however, look sweet and natural. Yay for you, getting the award! Pictures of me always get me making stupid faces. congrats on the well deserved award...t.
here's a smile from another virgo! i'm glad i clicked through from bloglines today, i love that virginia woolf quote in your side bar. perfect. a very deserved award for you , well done you. smile or no smile as long as you are happy inside ! T...I love your observations about your self. The hard/soft in the wrong places fits me also. The shots of you in the post are gorgeous! You are lovely, and I love your hair! If you've missed me on flickr, I've imposed an extended mini-break. No photography. No flickr. No time. I'm getting our new home ready to move into in two weeks. Lots of cleaning, painting, and this weekend we put new floors in our dining room, living room and our downstairs bedroom. Somewhere in there I have to pack. I am so sore now I can barely type. What am I doing here then? Well, I do check my email and RSS feed daily, and your post came up :-) Glad it did. Your award is fitting for you always brighten my day with your posts. Congrats! I'll enter! and congrats on the award! I agree that getting a good photo can be hard. I usually start to look impatient. Theresa, your smile is beautiful. Congrats on your award T! You are beautiful inside and out and it is so nice to get to know you better. I agree with the freezing in front of the camera...I do not like having my picture taken at all. I like the safety of being behind the camera. Congratulations on your award and do agree.. wonderful blog. After reading I want to get off of the computer and go back to knitting. you wickedly got a smile out of me very late last night on flickr and this morning! i love everything you are because you truly are YOU! congrats on the award and that someone will be smiling from your handmade gifts! You make us all smile and I'm certain you smile in your heart all the time. I'd rather be behind a camera than in front of one. congrats on the award. no worries on the smile. I mostly smile inside. maybe you too. and thanks for smiling- since you always make me smile! I SO know what you're talking about! Congratulations on your award! As for smiling - - as long as you do smile - off the camera is just fine! congratulations on your award. Can't wait to see what beautiful knitted surprise you have for us! You and your lovely blog are most deserving of this award! Congratulations! Smiling is a struggle with me in front of the camera or not...the positive is that most folks say it's so rare that it makes it extra special when it appears. 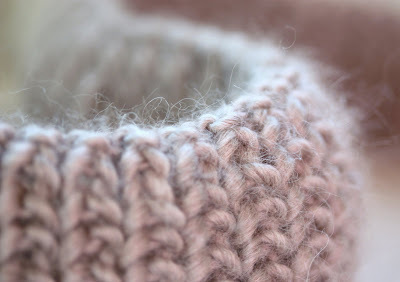 I enjoyed the tidbits about you...and your new project looks like soft knitting goodness! You and your smile are beautiful! True and loyal. Well said. No entry into contest - someone who isn't such a prolific knitter as myself should win! Lucky person that will be. Oh, I do love surprises! Well... it does not surprise me you got the award; you are really talented! I am smiling right now, when I read your blog. It sort of has that effect on me. I bow to you too! Your photo's made me laugh. Love the first one. Thanks for sharing. What a lovely post - true to form:) I hate having my picture taken and my smiles never make it to my eyes unless someone "catches" me - but since I am usually taken the pics, that almost never happens:)Namaste back at you! I need something to smile about today, so thanks for that post. I am too shy to have a blog, but I enjoy reading yours and others. One of Mom's husbands was a Virgo. He was very hard on himself. He always seemed to feel he was too handsome, too intelligent, too charming, just too perfect for words. I hated to see him beat himself up that way. Hope this brought you a smile! Congrats on your award. I'll bet you have a beautiful smile. Beautiful words as always. I applaud the clever way you responded. Yay for you! I can see you smile... really, I can see it, you can't even hide it, it just shines right on through. It happens to lovely people. You deserve that award, well done. x Not smiling in front of the camera is better than pulling really silly faces, which I do totally unconsciously! Félicitations, you have a lovely smile and it always shines through in your work. you are beautiful....revealing yourself in such an honest way.